Earn $56.90 in Podium Club credit (5690 points)What's This? 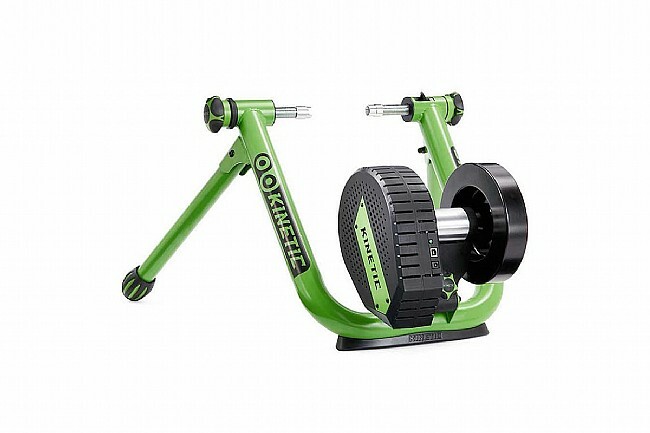 The Kinetic Road Machine Smart Control Trainer starts with a class-leading trainer frame and adds electronically controlled resistance for a seamless and precise indoor training experience. A wide footprint and adjustable legs ensure a sturdy foundation for high-intensity workouts, and a large 14.3 lb flywheel provides smooth acceleration and run-down. It connects via Bluetooth to Android or Apple smart devices to allow Kinetic's Fit app as well as third-party apps like TrainerRoad and Zwift to wirelessly control the trainer's resistance to simulate virtual road conditions and terrain. It also transmits power, speed, and other data for tracking performance and sending it to Strava, TrainingPeaks, and similar fitness trackers.